Freediving represents one of the most natural of sports, where humans attempt to push the limits of depth and diving apnea. 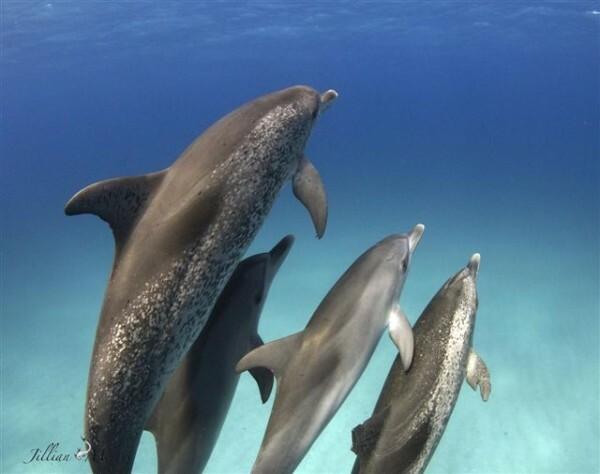 Diving by humans emulates the performance of the more aquatically adapted marine mammals. Although the records set by competitive freedivers are impressive, they are far from the extremes set by marine mammals. These aquatic animals have truly impressive diving capabilities. The premiere diver is the sperm whale, which can remain submerged for over an hour and dive to depths of over one mile. Although such a maximal effort may be associated with the size of this leviathan, seals and sea lions of the scale of humans still put us to shame. As much as we endeavor to perform like marine mammals, we fall short. The limits to human diving ability are constrained by biology, through our physiology and morphology. The physiology dictates the heart rate, oxygen consumption, resistance to pressure, blood chemistry, and oxygen storage in the lungs, blood and muscles. While these physiological parameters can be adjusted within limits by training, we are largely stuck with the shape of our bodies and the mechanics of propulsion through water. The design of the body determines the drag or resistance from the flow over the body. Streamlined, fusiform body designs are ubiquitous in fast-swimming animals to minimize drag, but the shape of humans is less than optimal for drag reduction reducing swimming efficiency. Furthermore the mechanics of propulsion during diving is inefficient. The small size of our feet and a musculoskeletal system are better adapted to terrestrial excursions than aquatic propulsion. Even application of the inappropriately named “dolphin-kick” offers little additional thrust generation to transit deeply with limited oxygen availability. To swim rapidly with greater propulsive efficiency, divers have enlisted the use of swim fins and monofins. Like the fins of aquatic animals, the increased area of the propulsive surface affect a large mass of water to transfer momentum from the actions of the swimmer into the wake. Traditional swim fins work with the flexibility of the fin blade and resistance of the water. As the foot of the diver moves up and down, the transverse pressure of the water bends the blade from the more rigid base toward the flexible tip. In effect, a wave is passed down the length of the blade, which grows in amplitude toward the blade tip. Such a mechanism mimics the propulsive movements of many fishes that undulate the body and caudal fin to swim. These fishes use a combination of acceleration reaction and drag to produce thrust. Although effective, the mechanics of such a propulsive system is limited in terms of speed and efficiency. Can we do better and develop the next generation of propulsors that take advantage of the design and movements of the fastest and most efficient swimmers in the sea? 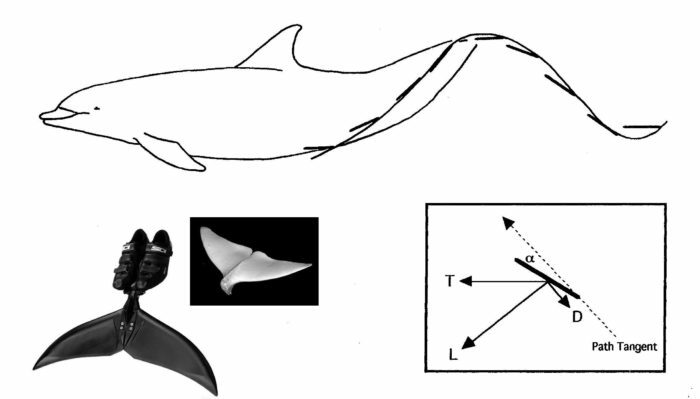 The illustration shows the oscillatory motions of the flukes of a swimming dolphin through a stroke cycle. The tips of the flukes move along a sinusoidal path. The insert shows the path tangent and the angle of attack. By canting the flukes at an angle of attack a lift (L) and drag (D) are generated. The lift force can be resolved into a forward directed thrust (T) throughout the stroke cycle. The biomimetic Lunocet and dolphin flukes are shown to note the similarity in design. Biomimetics or bio-inspired design is a relatively new field of study that seeks to incorporate novel structures and mechanisms from nature into the design and function of engineered systems. It has been a long-standing idea that new technologies can be developed from natural designs, particularly in those cases where the biological performance exceeds the current technology. Examples of biomimetic applications include the development of Velcro® based on the burrs of plants, the woven pattern in Speedo® Fastskin swimsuits in an attempt to emulate the drag reducing properties of shark scales, and copying the beak of the kingfisher for a redesign of the nose of the Shinkansen bullet train to alleviate tunnel boom. Animals have been targeted for biomimetic applications due to their locomotor abilities that allow them to function in complex, high-energy environments, locomote with high speed and high efficiency, and maintain stability and tightly maneuver. Because biological designs resulted from the evolutionary Darwinian process of “natural selection”, it is considered that animals have performed the “cost-benefit analysis”, optimizing particular designs for specific functions. With potential improvements to existing propulsive systems using the biomimetic approach, funds have been invested by various governmental agencies, including the Office of Naval Research from which I derive much of my funding to study the mechanics of animal swimming. My research has focused on the lift-based propulsion used by dolphins. These animals swim by oscillating their wing-like flukes. The moderately stiff flukes are lateral extensions from the tail that are made up of tightly packed fibers. As the flukes move up and down, they are canted at an angle to the flow (i.e., angle of attack). The flow dynamics produces a lift force like for an airplane wing, but for the flukes of the dolphin the lift is directed forward throughout the oscillatory cycle and generates the thrust needed for propulsion. The advantage of lift-based propulsion is that the operational range allows for higher speeds and higher efficiencies than undulatory swimming of most fishes (see above). Dolphins are capable of swimming speeds of over 27 mph and can maintain propulsive efficiencies of 80 to 90%. To put the principles of biomimetics and natural propulsive systems together, a collaboration between Ted Ciamillo and myself led to the production of the Lunocet. The Lunocet is a monofin that resembles the design and operation of dolphin flukes. Unlike traditional monofins, the Lunocet derives its propulsive force from lift generated as the fin is oscillated. Separation of the swimmers feet from the fin blades through a narrow peduncle allows for adjustment of the angle of attack to increase thrust production with reduced drag. Use of the Lunocet for freediving could result in rapid movement to depth. Furthermore, swimming would be more economical allowing divers to extend their oxygen reserves and submergence when swimming. Compared to human swimmers, aquatic animals display greater swimming performance, having the advantage of being adapted already to life in water. Animals are capable of manipulating flow around the body to operate at high speeds with high propulsive efficiency. As we continue to make forays into deeper water, we may take lessons from animals. Nature retains a store of untouched knowledge that may be of benefit to the goals that we set in pushing the boundaries of our diving ability. The use of technologies based on biomimetics can be at the forefront of extending freediving operations, while providing natural solutions that augment our own biology. The above story is based on materials by Deeper Blue .